UPDATE: Quad's new Elite line-up breaks cover, prices revealed | What Hi-Fi? All five models will be available from September. 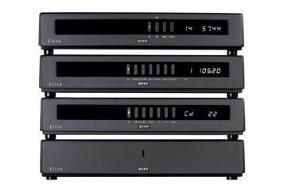 The Elite CD-P CD player/preamp and an additional stereo power amp to replace the existing Quad 909 will join the range by the end of this year. We'll be reviewing the new series as soon as we can. Quad's highly-regarded 99 Series components, launched in 1999, are set to be replaced over the next few months by an all-new Elite Series. Six models will be available, with the first two arriving in shops later in the Summer, and the line-up is similar to that of the 99 range. There'll be an Elite CD-S CD player, using a Sony mechanism and Crystal 24-bit/96kHz digital to analogue conversion with upsampling, and an Elite CD-P CD player/preamp. This uses the same mech with 24-bit/192kHz Crystal conversion, and has three optical and three electrical digital inputs. The Elite Pre preamp has three line-ins, one tape loop and moving magnet phono input, with moving coil available as an option: it can be used with either the 90W per channel Elite Stereo power amplifier or a pair of the 150W Elite Mono moboblocs. Connection between preamp and power amp(s) is via conventional RCA sockets or Quad's AmpBus system. Completing the range is the Elite FM radio tuner, and prices for the range are yet to be announced. This, the company says, allows the new range to build on the classic Quad sound, but with added clarity and definition. The Quad Platinum system, seen at shows over the past couple of years, remains in prototype form, the company saying that when launched it will slot into the range above the new Elite models. Also on the way from Quad is a new compact speaker design: the 11L Classic will be available later this Summer.